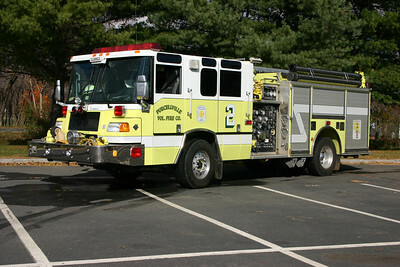 Purcellville Volunteer Fire Company - Station 2. Fire Station 2 - Purcellville. Rescue Engine 602 is this 2008 Pierce Quantum Puc equipped with a 1500/750/40/40. Photographed in May of 2015. A back end view of Rescue Engine 602, a 2008 Pierce Quantum PUC 1500/750/40/40. Purcellville, Virginia Engine 602, a 2018 Pierce Velocity 2000/750/40 and job number 31324. 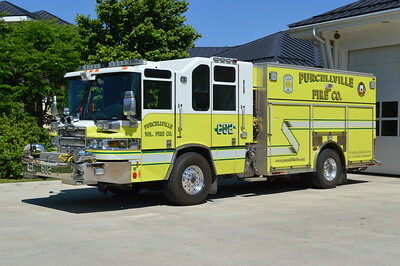 Purcellville, Virginia Engine 602, a 2018 Pierce Velocity 2000/750/40 and job number 31324. The rack on the officers side holds three hard sleeve hoses for rural water supply. Tower 602, a 2015 Pierce Velocity 100', as photographed behind Station 2 shortly after being delivered. 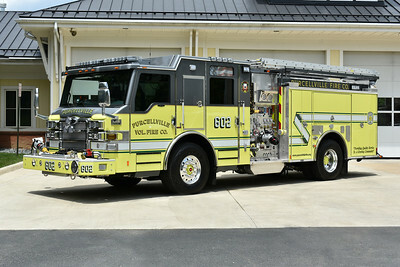 An officer side view of Tower 602 from Purcellville, Virginia. Note the "Honoring Our Fallen" emblem on the box by the ladder. 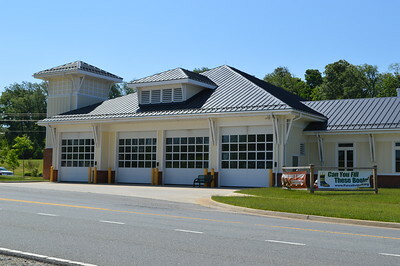 Tower 602 at Purcellville was delivered in November of 2015. It is a 2015 Pierce Velocity 100' with Pierce job number 28477. That silver color is a "silver metallic" and looks even better in person. 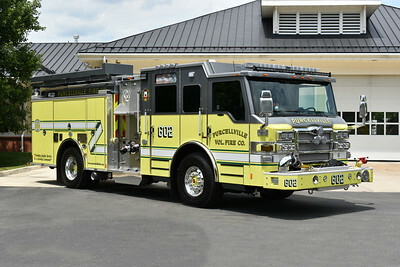 This is Purcellville's first truck in the new colors. 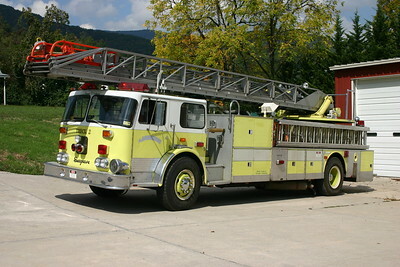 The Pierce replaces a 2002 KME 102' 1250/300. 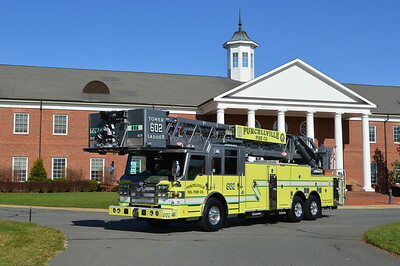 Tower 602 was photographed in front of a building at Patrick Henry College in Purcellville. Another view of Tower 602 at Patrick Henry College. 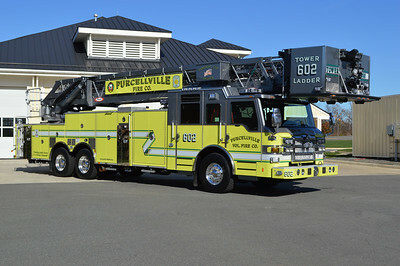 Tower 602 - 2015 Pierce Velocity - Purcellville - A somewhat unique feature of the tower is that the cab steps are "automatic", they automatically come out when the cab doors are open. Very similar to the steps on the department's two Pierce Quantum engines. Purcellville's first tanker, a 2006 International 7600/2007 4-Guy's 1500/3000. This was one of the first county purchased tankers. Purcellville Brush 602 received some new paint and graphics in 2017. It is a 1992 Ford Super Duty/EBY/Singer/2017 FastLane equipped with a 500/300. The silver color was added to match Tower 602. New sign boards on Purcellville Brush 602 when photographed in November of 2017. 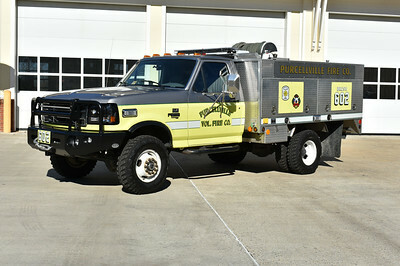 Purcellville's Brush 602, a 1997 Ford F Super Duty/EBY/Singer and equipped with a 500/300. Photographed in May of 2015 to the rear of Station 2 prior to the rehab. 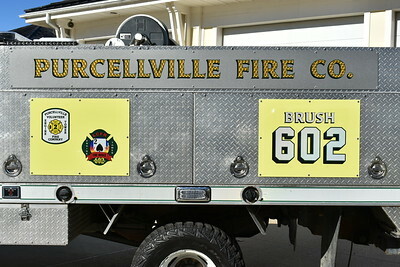 Brush 602B from Purcellville Volunteer Fire Company. 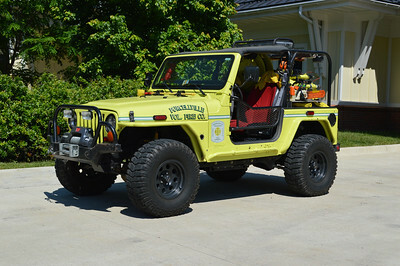 It is a unique 2000 Jeep with a 2007 RKO skid package. It was completed in 2008 by Purcellville Fire. The Jeep was purchased in 2006 at a local car dealership. 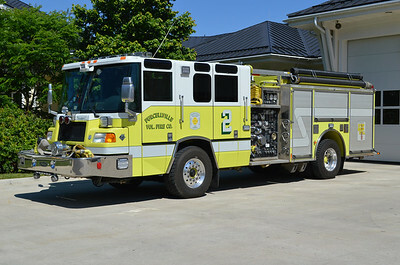 It is equipped with a 90/75/5 and photographed to the rear of Station 2 in May of 2015. 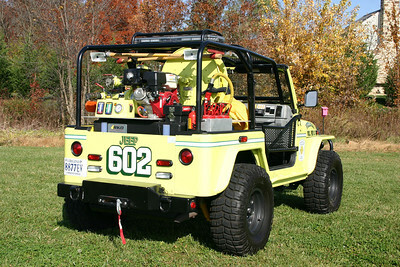 A back end view of Jeep 602, as photographed in an open field next to the old Fire Station2 in Purcellville. 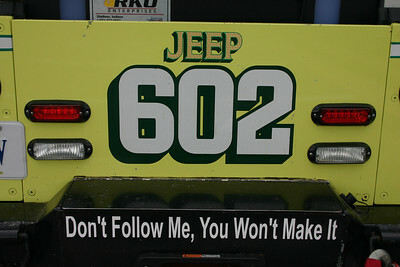 The rear of Jeep 602, as it appeared at the 2011 Apple Blossom firefighters parade in Winchester. 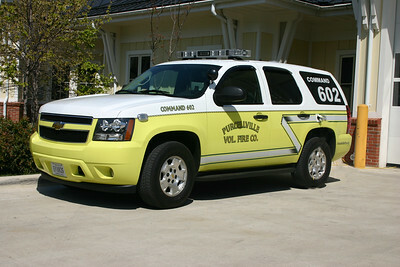 Command 602 is a 2011 Chevy Tahoe/FastLane. 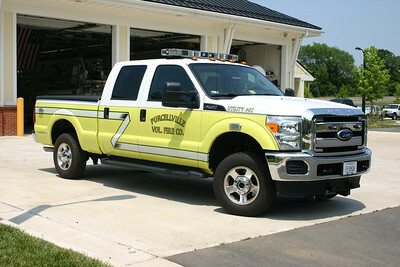 Utility 602 is a 2010 Ford pick up outfitted by FastLane, also located in Purcellville. Old Wagon 2 in Purcellville was a 1988 Pierce Lance 1250/750. It was sold to Conicville, Virginia (located in Shenandoah County) in 2009 (see next photo). 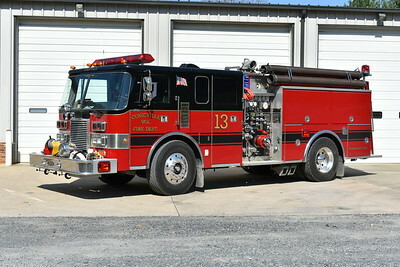 Engine 13 from Conicville was received in 2010 from the Purcellville Volunteer Fire Department in Loudoun County, Virginia. Engine 13 is a 1988 Pierce Lance that had a rehab in 2010 by Appalachian Freight, who also painted the Pierce black over red. 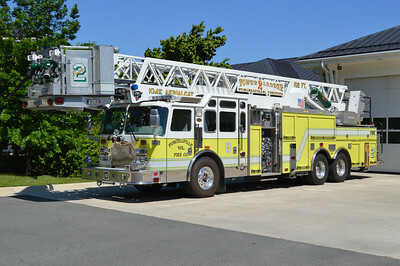 Equipped with a 1250/750 and Pierce job number E4217. 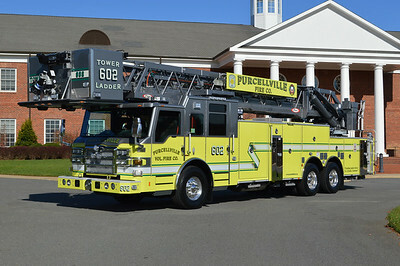 Purcellville's Engine 602 with new warning lights. It is a 1999 Pierce Quantum 1250/750. Photographed in May of 2015 to the rear of Station 2. 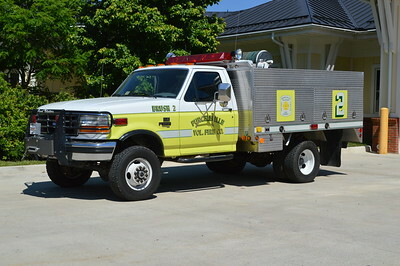 Donated to the St. Charles VFD (Lee County, VA) in August of 2018. Engine 602 is a 1999 Pierce Quantum 1250/750. 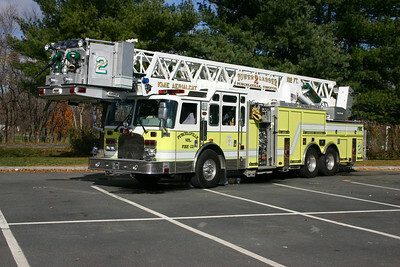 Engine 602 was photographed at Loudoun Valley High School. A group of fire apparatus photographers from across the state of Virginia (with representatives from several fire department magazines, on-line web sites, etc.) have visited Loudoun County stations on several different occasions. 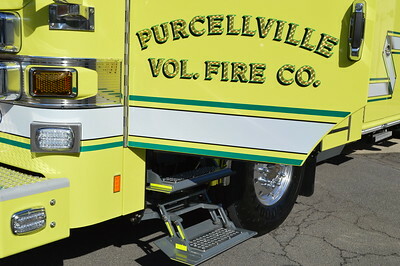 Departments such as Purcellville welcomed the visitors and made arrangements to have the apparatus photographed. St. Charles, Virginia in Lee County. This 1999 Pierce Quantum was photographed in July of 2018 in Purcellville, Virginia, many miles away from St. Charles (just over 400 miles). 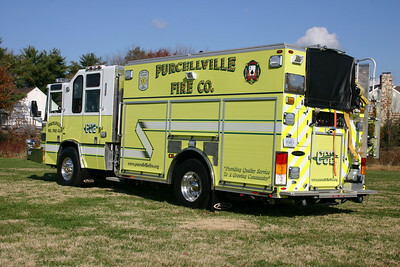 Purcellville donated the Pierce to St. Charles. 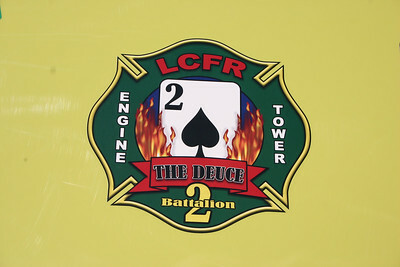 Not only did they donate the truck, they had it lettered and numbered for St. Charles and arranged with other Loudoun County departments to donate hose and equipment. 1250/750 with Pierce job number EC 241. 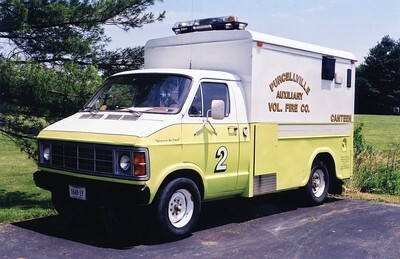 Former Wagon 2, a 1976 Ford C/American, 750/650. Sold to Shenandoah Shores (Warren County), Virginia. 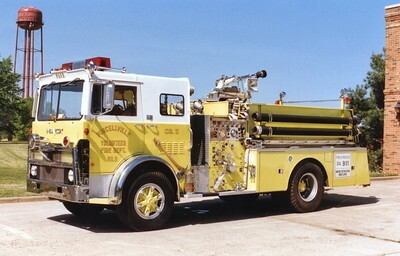 Former Engine 2, a 1980 Mack MB, 1000/750. Tower 602, as photographed late in its career in May of 2015. When photographed, Purcellville's new Pierce tower was being constructed. Tower 602 is a 2002 KME Aerial Cat 102' equipped with a 1250/300. For sale as of December 2015. 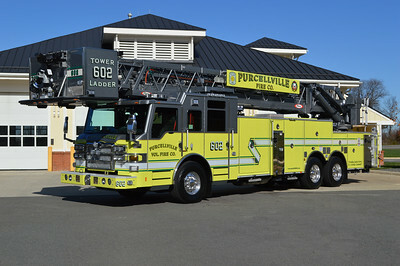 Tower 602 from Purcellville - a 2002 KME Aerial Cat 102' 1250/300. Note the combination of regular and roll up compartment doors. 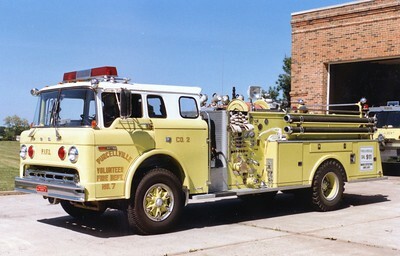 Former Truck 2 from Purcellville was this nice 1974 Seagrave SR, 100', sn- D75015. Rehabbed in 1991 by the Brunswick Correction Facility. Former Sterling Fire Department, sold to Circleville, West Virginia. Despite no lettering, this was a great find for me with my Loudoun County ties. 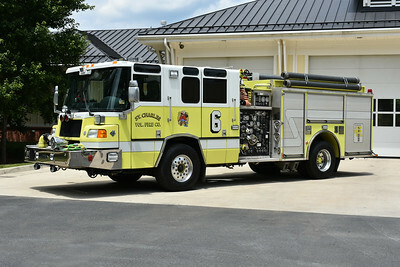 Truck 58 for Circleville, West Virginia is a 1974 Seagrave SR20768 that was rehabbed in 1991 by the Virginia Department of Corrections - Mecklenburg, Virginia. It is a 100' with serial number D-75015. 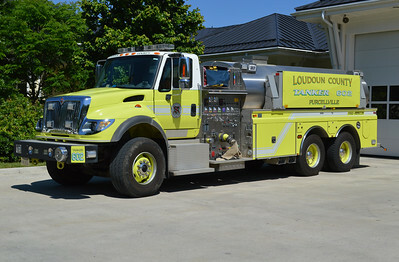 Two Loudoun County stations operated this truck. 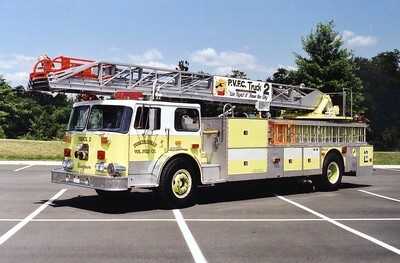 It was originally delivered to Sterling Park, Virginia as Truck 11, their first aerial. 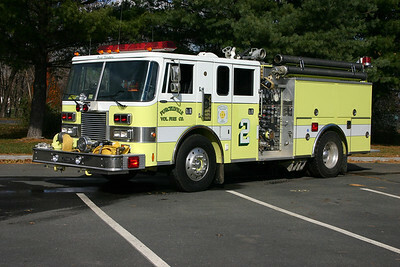 It was then sold to Purcellville to run as Truck 2 in Loudoun County, also their first truck. From Purcellville it went to Circleville. 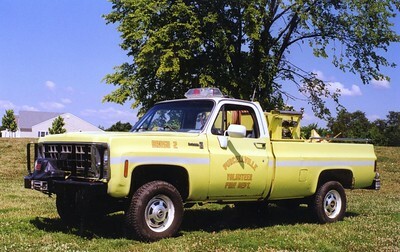 Former Brush 2, a 1980 Chevy 20, 200gwt. Sold in 1998 to a private owner. No information on former Canteen 2 from Purcellville. 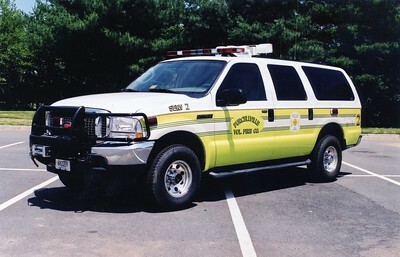 Former SERV 2, a 2003 Ford Excursion/FastLane. Note the unusual light tower on the roof.